October Favorites: My 2018 Sephora VIB Sale Guide! It’s here, it’s here! The VIB sale is here and I’m so excited to share with you my favorites right now. You guys always ask for a guide to my faves during this sale, so here it is! I’ve done these in the past, but some of my favorite products have changed. ALL of these items here are ones I use and have used a ton (I tell you all about each product below!) – which you probably know since they are always in my favorites posts. I believe that VIB rouge access starts today and next weekend is VIB access. If I buy anything exciting, I’ll come back and update this post! And be sure to let me know what you’re loving and what’s on your list in the comments. Dr. Dennis Gross Daily Peel Pads. I haven’t stopped raving about these since I bought them and they have changed the texture of my skin. Can’t imagine ever going without these now. I use them every other day. Dr. Dennis Gross Vitamin C+ Collagen. This is my current vitamin C serum and I am loving it. I use it daily before moisturizer. Dr. Dennis Gross Ferulic + Retinol Eye Serum. I use this every other night around the eyes and I *think* I’m seeing a difference. Caudalie Moisturizing Toner. I use this every single day, morning and night, with an exfoliating cotton round. It’s the best! Drunk Elephant LaLa Retro Whipped Cream. This is my favorite nighttime moisturizer, but it also works during the day too! Drunk Elephant Protini PolyPeptides Cream. I use this one during the day under makeup. It dries down so nicely and is slightly more of a gel texture. Drunk Elephant C Tango MultiVitamin Eye Cream. I’ve gone back and forth between eye cream and this is my favorite due to the pump and the way it feels under makeup. It’s great. Drunk Elephant C Firma Day Serum. I’m currently using the C serum above, but I still really like this one. I used it for years and may go back to it! Sunday Riley Good Genes. I’m annoyed at the SR controversy where they paid employees to give their products positive reviews. But I’m still OBSESSED with this product. It works wonders on my skin. I alternate it with the peel pads above. Sunday Riley Luna Oil. Same same. But this product is good. I really love it and love it best under the good genes. You can’t use this if you’re pregnant though because it’s a retinol. Kate Somerville Exfolikate. This is the only physical exfoliator I use on my face. I also use this on my body and it’s great. It has a chemical exfoliate in it as well. Dr. Jart Hydro Sleep Mask. This saves my super dry skin in the winter. You put it on at night and sleep with it. It cures my dry skin in one use. First Aid Beauty Ultra Repair Cream. I love this cream for all over the body! Derma Doctor KP Duty Scrub. I only use three body scrubs: the exfoliate above, my homemade ones in The Pretty Dish and this one. If you have those bumps on the back of your arms or if you have eczema, this is great. Derma Doctor KP Duty Cream. Same as the above, in cream form! I don’t use this every day or even every week, but I use it as needed. Eddie really loves this too. Beauty Blender. If I wear any sort of foundation, this is the only thing I apply it with. I also apply concealer with it. Charlotte Tilbury Hollywood Flawless Filter. I am LOVING this combined with BB cream. Such a pretty glow. Bare Minerals Complexion Rescue. This is my daily go-to for any sort of color or foundation on my face. It’s super light and I’ve used it for years. I use the shade vanilla. Dr. Jart Premium BB Cream. This is another BB cream I use and have for years. If I need more coverage, I use this as it’s thicker. Sometimes I also mix this with the complexion rescue. Fresh Sugar Advanced Therapy Lip balm. Definitely my holy grail lip balm. It’s pricey and not one I keep in my purse (because they always go missing! ), but it’s amazing for dry lips. Laneige Lip Sleeping Mask. Another great option in a pot for dry lips. You can still feel this on your lips in the morning. Kevyn Aucoin The Contour Book. I have volume one of this and it’s great for traveling. If the colors work for you, it has everything you need. Kevyn Aucoin Celestial Bronzing Veil. I use both shades of this bronzer (tropical days and tropical nights) every time I wear makeup. The days shade is great for bronzing and I find that the nights shade is better for contour. It’s much cooler. NARS Fort de France Highlighter. I’ve had this highlight for a few months and love it. It’s definitely more shimmer than I need sometimes, but it’s gorgeous. Hourglass Ambient Lighting Powder in Luminous Light. This one is my go-to forever subtle highlight. You just look perfectly glowy with this. I love it so much! Benefit Gimme Brow. The ONLY thing I use on my brows. It’s so natural. Nothing compares to the tiny brush. Nars Pro Prime Smudgeproof Base. This is my favorite for eyeshadow base. RMS Magic Luminizer. I’ve rambled about this ALL year. It’s an incredible gel-like luminizer and you can wear it on days you don’t wear makeup. It’s super pretty! Milk Makeup Eye Pigment. I bought this in Chicago while on my book tour and have used it everyday since. And I love it on its own but it’s also a great base. I have hotel lobby and after party. Pat McGrath Luxetrance Lipsticks. If I had to recommend an entire line of lipsticks right now, these would be it! I LOVE the formula. Marc Jacobs Eyeconic Eye Palettes. These are my current favorite palettes that check every box – great pigment, so blendable, pretty shades and perfect for travel. I have glambition and provocouture. They are SO pretty. So I feel like perfumes are obviously tricky to buy online. I LOVE all warm, amber-like scents. I don’t love florals. These are some of my favorites below! Tom Form Noir Pour Femme. Elizabeth and James Nirvana Bourbon. Elizabeth and James Nirvana Black. Jo Malone Mimosa and Cardamom. T3 Whirl Trio. I bought this at a VIB sale a few years ago and still use it weekly. It is an amazing high-quality set that took me a long time to buy (so pricey!) but I use it SO much. And I love that it comes with three sizes of the wand. Living Proof Perfect Hair Day. I love this for styling when I have to blow dry my hair. the Dry Bar Straightening Brush. This is a WANT… it’s on my list, and basically the only new thing that I may grab! These are my absolute favorite candles to burn during the holiday season! And they never go on sale, unless you’re lucky enough to fine leftovers come January. The reed diffusers also last a few months in my bathrooms. I always get these as gifts during this sale and sometimes buy an extra so I have one come September of the next year. 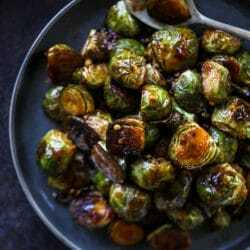 Sweet and Spicy Brussels Sprouts. Love all these picks, but I’m also particularly into Dr. Dennis Gross, Caudalie, Kate Somerville and Drunk Elephant (among other brands, but I just kept my list here to the ones you mentioned). Murad Hydro Dynamic Ultimate moisturizer for my (soon to be) dry, winter face. Bought it last year to try and loved it. I also love the little scoop/paddle it comes with to scoop out the proper amount–I’m so guilty of applying too much moisturizer! So many great picks! I’m intrigued by so many of Drunk Elephant’s products but they’re so expensive! :'( I like the sound of that eye cream and the retro whipped cream! Was just going to ask your recommendation on eyeshadow primer and candles!!!! I love the Sunday Riley products as well. Just out of curiosity, what did you use instead of the Luna oil while pregnant? Also the Laneige lip mask is amazing. I put it on before bed every night and I no longer need to apply anything during the day! Cannot live without Gimme Brow! I want to try Glossier Boy Brow but I keep talking myself out of it because Gimme Brow is so good, why try something different? I think I’m finally going to pull the trigger on Complexion Rescue; I hear so many great things about it and I need something for winter that is really moisturizing but still thin. You can’t beat glossier’s quality for the price! Try Boy Brow – Glossier is AMAZING about refunds/customer service, so if you don’t like it, email them and they’ll give you a refund! I recently pulled the trigger on the Drunk Elephant C Firma Serum thanks to many rave reviews from your posts – so far I love it! I also conveniently purchased it shortly before you mentioned switching to Dr. Dennis lol, so I’m glad you mention your lasting love for it here. Also I know I’m the 927,987,542th person to rave to you about Glossier, but for the price, its the best skincare product’s I’ve ever used. I’m in love with the Solution, I’ve had amazing results in the texture of my skin and occurrence of blemishes. I have fine hair, so I know Boy Brow isn’t for everyone, but I can’t live without it either. Honestly 90% of my routine is Glossier, so I’m biased. But there are a few products that rise above the rest, and I’d love to know if you’ve tried them! sooooo…remember me…girl who thought there must be something better than dennis gross C serum who thought she would spend an arm and a leg for skincueticals ? well i did that….and am returning it ! after about 15-17 days of using the skincueticals i started breaking out on my chin and a blemish on my neck (?). i also got tiny tiny bumps on the my nose (like texture i guess?) and near my hair line. not red like irritation, just bumps like fine grains of sand. i seriously changed nothing else ! so that pricey skineuticals (am i spelling this right?) is getting returned and an order has already been placed for dr dennis gross. why do i keep thinking i am one product away from looking 21 ???? a side note – im also loving born this way too faced concealer, nars radiant foundation (recent switch for me), and repurchasing lala because my face is starting to dry out for winter…sigh. love these posts ! ahhh i didn’t think they had the ginger biscuit at sephora? ginger biscuit is def my fave!! I love, love LOVE Elizabeth & James Nirvana! White is my favorite, Black is second favorite, also love Bourbon and Rose which I got in tiny bottles in my stocking last year. Pretty sure Santa is leaving me Amethyst and French Grey in my stocking this year. That Santa, he knows me. It’s 3:58 m and I’m putting products in my Sephora shopping cart like a sleep deprived mad women. My total is over $400 – Eep! 🙀I love so many products you recommended and want to try too many new ones. I’m going to curse my self for skin crazed shopping! Time to leave the Sephora app and rethink what I must get and what I can wait on, after a little sleep! I have purchased many products based on your reviews, we seem to have the same skin type! I was wondering what face wash you use! Thanks in advance! LOVE your blog!